Normally, when I get an invite from a restaurant, it would either involve myself eating alone or possibly inviting one guest. Sounds about right because what can one expect (most independent places don't have deep pockets)? 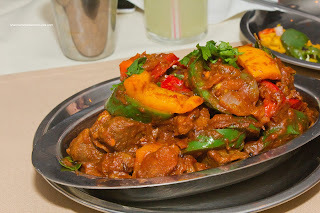 However, some types of cuisines call for more than 2 people to fully appreciate the diversity of the menu. Of course, any type of food can be shared, if you really wanted to, but some are just meant to be shared. Chinese, Italian, Japanese and Indian immediately come to mind. There are too many to list them all. 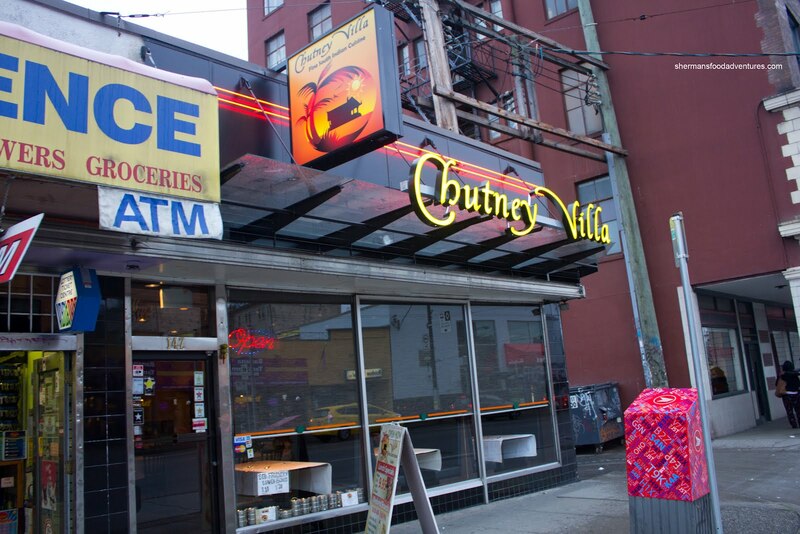 So when I got an email inviting me to try out the food at Chutney Villa, it got me thinking. You see, I rarely if ever, get an invite from an Asian restaurant. Therefore, I don't often have this dilemma: eating all by myself and ending up trying like a couple of dishes (which I can't finish anyways). That just wouldn't be right or fair to the restaurant. I certainly couldn't write a blog post that would be reflective of the food. So I did something that I've never done before - ask if I could bring a few more guests. Not only did they think it was a great idea, they thought only a few didn't cut it. Thus, I got a grand total of 6 more people to eat with me. Who to invite though? Well Mijune was a no-brainer because she could bat clean-up. I got Viv since she would've killed me otherwise. Miss Y was game and so was Mijune's sister and boyfriend. For those who are unaware, Chutney Villa is a Southern Indian/Sri Lankan restaurant. Okay, what's the big deal? 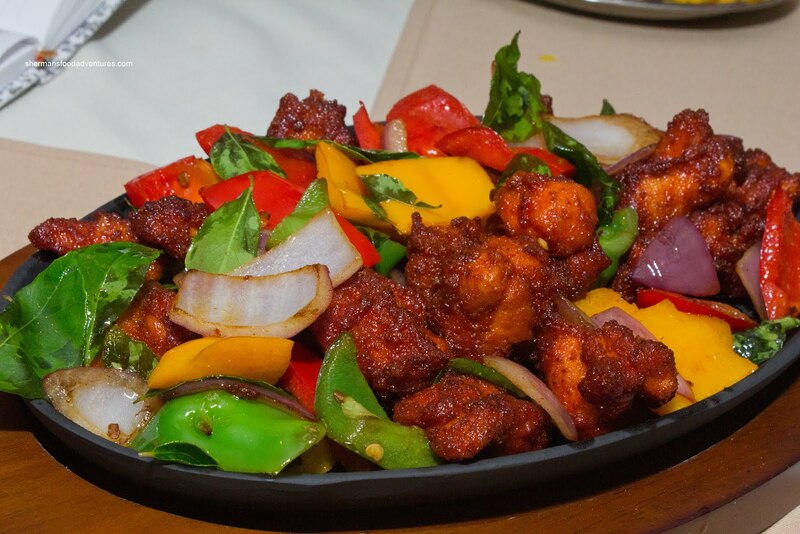 Well, most of the Indian restaurants in the Lower Mainland are Northern, in particular representing the Punjabi region. Hence, we get the usual naan + rice + curry (such as butter chicken, tandoori chicken and lamb rogan josh). Southern Indian food features more seafood and of course the dosa. 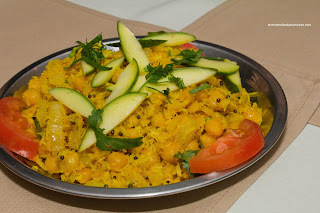 Therefore, it is less about the curries and more about other things that we normally do not associate with Indian food. To start things off, we were presented with an array of appetizers. 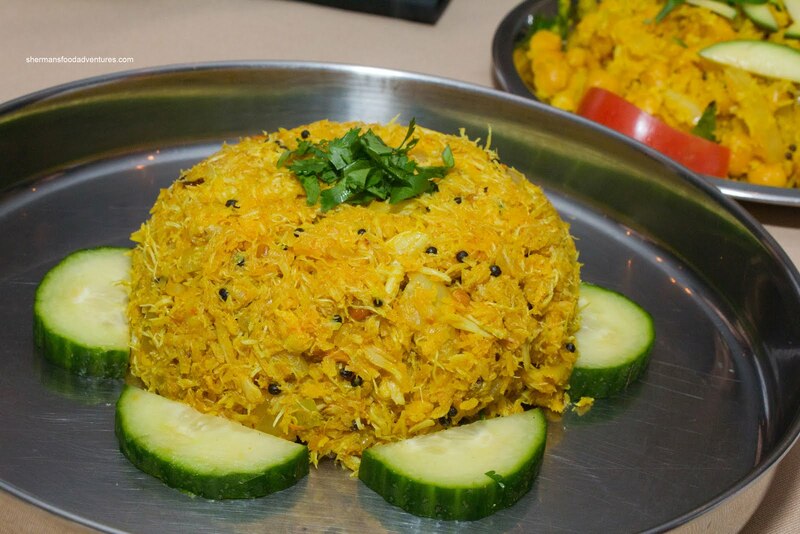 The first one we tried was the Manga Thenga Sundal which consisted of onion, coconut and chickpeas. 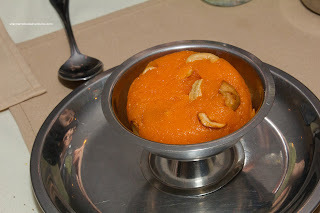 This was an aromatic and sweet concoction which I liked but did not love. It probably had something to do with my bias towards non-meat dishes. Viv liked this appie the most, so I guess it depends on personal preference. With that being said, it was pleasant enough to eat though. Now for my favourite appie - the Nandu Puttu which was a mix of crab, coconut, ginger, mustard seed, fennel seeds and onion. I absolutely loved this dish (yes, because there was meat as well). The fluffy crab was sweet and well, crab tasting. There was some spice to go along with the crunch of the seeds and aromatics of the shredded coconut. I could've eaten the whole thing myself it hadn't been for the gazillion other dishes that were served. Moving along, we had the Chicken 65 next presented on a cast iron plate. This was a combination of fried chicken morsels with red onion, pepper and basil. They used dark meat which resulted in a moist and flavourful nugget. It was only mildly spicy and it took on the aromatics of the peppers and onions. 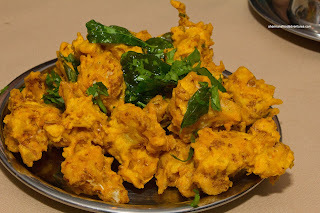 The Aachi Varuval (fried cauliflower in a peppery rice & lentil batter) was something I really wanted to compare with Nuba's crispy cauliflower. Alas, this would be like comparing apples to oranges. However, I couldn't get it out of my mind since the ones here were a touch dense due to the heavier lentil flour. Other than that, it was still crispy and the cauliflower had a stiff texture (which is good, mushy is not what you want). 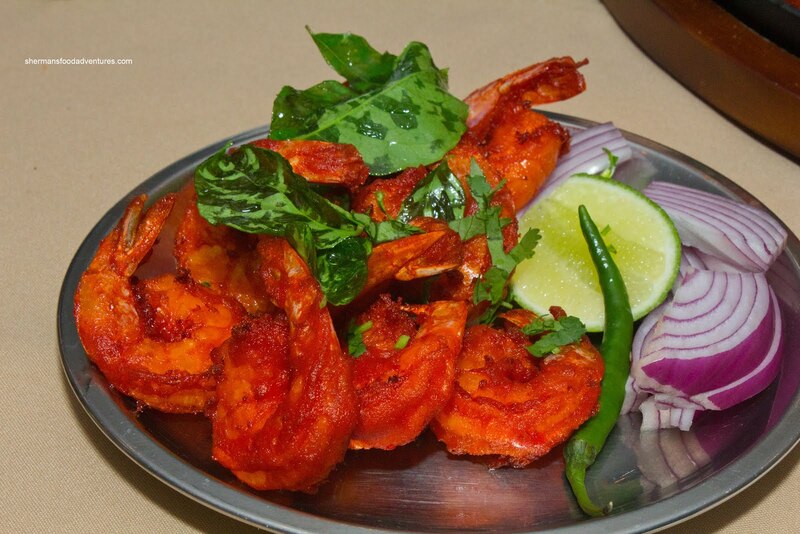 Our last appie was the Era Varuval or fried spiced prawns. These did not have any batter on them other than the spice rub which resembled tandoori while at the same time saltier. I actually found these to be overly salty. Mijune didn't think so since she has a higher tolerance to sodium. 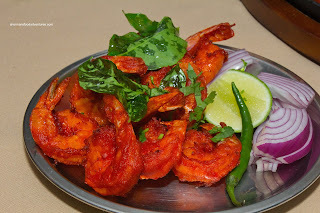 Other than the salt content, I like the prawns. They had a nice snap and were very flavourful. A squirt of lime brought a bit of balance to the flavours though. By now, I was pretty full from just the appetizers! 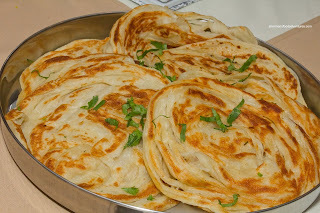 Then a a big plate of Paratha (South Indian-style of course) showed up. Much like a roti, this was our carbs that went with the upcoming main dishes. 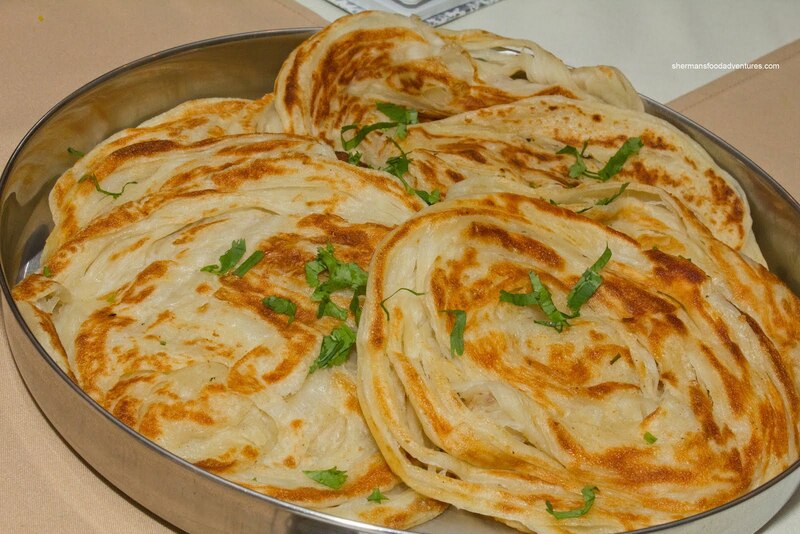 By appearance alone, the paratha was appealing with a nice crisp exterior that was beautifully browned. It was chewy in a good kind of way and had a underlying sweetness. 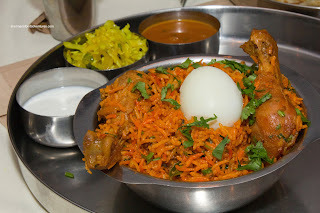 Onto the mains, we were presented with the Chicken Biryani consisting of 3 chicken drumsticks and a hard-boiled egg nestled in perfectly cooked rice. The rice was chewy and hit the sweet spot between dry and moist. I found the flavours to be slightly muted except for the strong aromatic coconut hit. Although there was plenty of chicken, it was slightly dry. As for the egg, it was overcooked with a dark ring around the yolk. 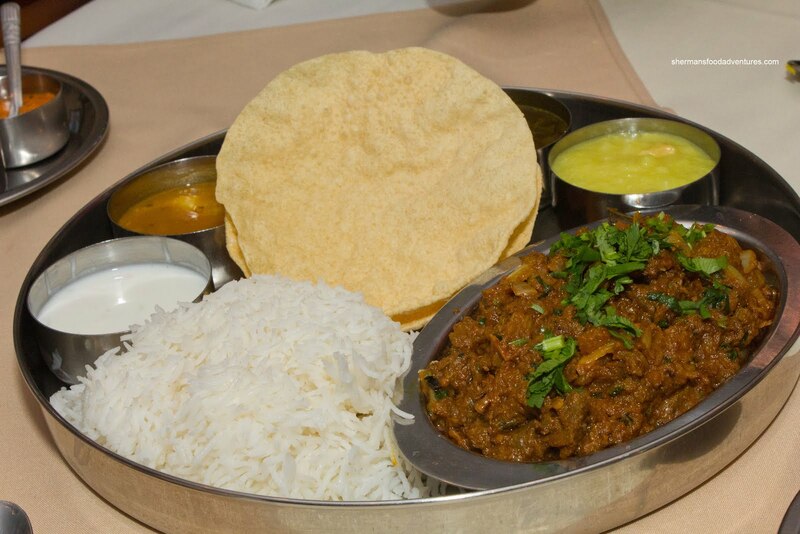 Arriving on a large platter was the Madras Lamb Curry. This could've been ordered a la carte or as a Thali (which you see here). Along with rice and papadum, there was pachadi (which is similar to raita), sambar, side veg, rasam, dessert and vadai (hidden underneath the papadum). As for the lamb curry, it was like a visit to flavour town where the lamb was moist and tender with a spicy and zesty kick. The masala exhibited many layers of flavour including ginger and of course cumin. Something we don't see much in Northern Indian cuisine is seafood, but for the South, that is a different story due to their proximity to the ocean. 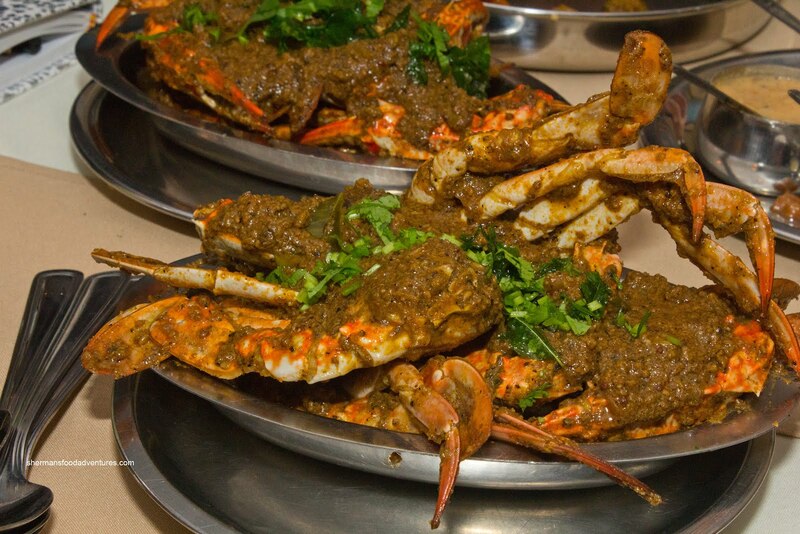 Hence, we got some blue crab in what they call the Deluxs Special. 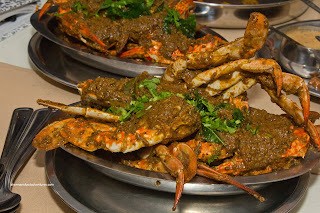 The crab was laced with black pepper, fresh coconut, fennel, chillies & curry leaves. There was a lingering spice which was quite pleasant (and not stinging). We also sensed a good deal of ginger which also added another layer of flavour. Now the spices were good, but since the crab was obviously not live, the flesh was soft and not that fluffy. That hindered my appreciation for this dish somewhat. We'd already had lamb, but then we were presented with something a bit more "mature" with the Mutton Devilled which is a Ceylon (Sri Lankan) specialty consisting of mutton with red onions, red pepper and spices. Since the meat is from sheep, mutton is typically tougher than lamb. However, they did a good job cooking the meat here where it was tender. Big hits of cumin and peppers complimented the mild heat of the spices. With all this meat, it was time for a vegetarian dish in the form of eggplant. 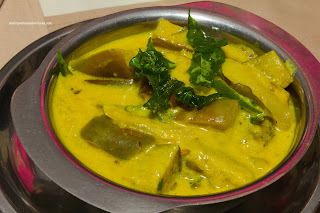 Yet another Ceylon specialty, the Katrika Pall Curry consisted of eggplant with coconut milk and subtle spices (the most obvious being turmeric for the colour). The curry was smooth and indeed mild. There were the usual flavours combined with the rich coconut milk. I liked how the eggplant was cooked all the way through without becoming a mushy mess. Now Southern Indian cuisine wouldn't be complete without a Dosa would it? We were presented with a Masala Dosa stuffed with potatoes, peas and carrots. Sambar was served on the side. 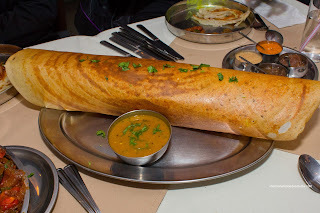 For those unfamiliar with a dosa, it is a rolled rice and lentil flour crepe usually filled (or can be eaten plain) with potatoes or a meat curry. The dosa here was pretty good where the crepe was crisp and light. The filling was pretty standard with soft potatoes laced with spicy curry. By now, I was lolly-gagging my way through the meal. However, Mijune was eating away like she had been stranded on an island for the last month. Wilson! 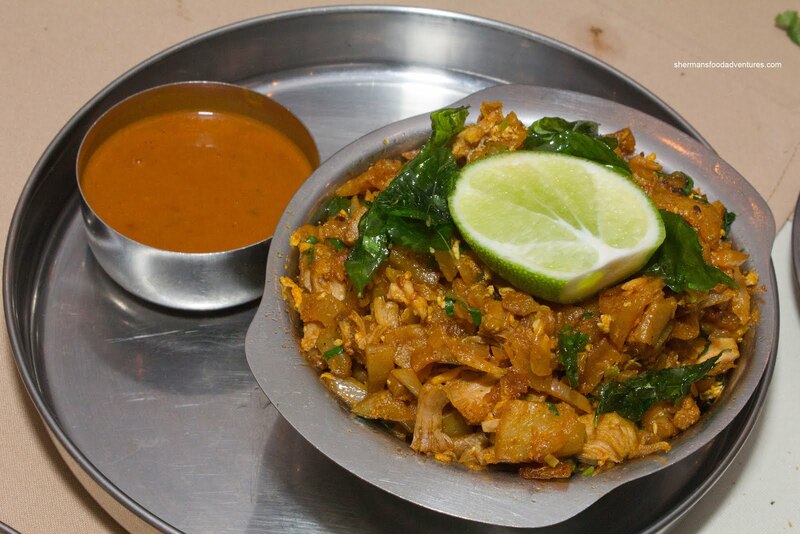 Wait, that's Tom Hanks... Anyways, to my utter surprise, we were presented with the Chicken Kothu Rotti. I looked at it with confusion. I've never had this dish before, but Mijune apparently had - as she took time away from her chewing to explain it to us. She described it as their version of the Chinese "Gon Chow Ngau Ho" (stir-fried rice noodles). Naturally, it wasn't exactly the same thing, but we got the idea. Instead of noodles, they used shredded Paratha with egg, chicken and spices. I found it to be dense and doughy, yet in a good kind of way. There was a good balance of sweetness to go with the savoury and spice. As we were eating, I had made the comment that since we had the vadai, the only thing missing was the Idli. 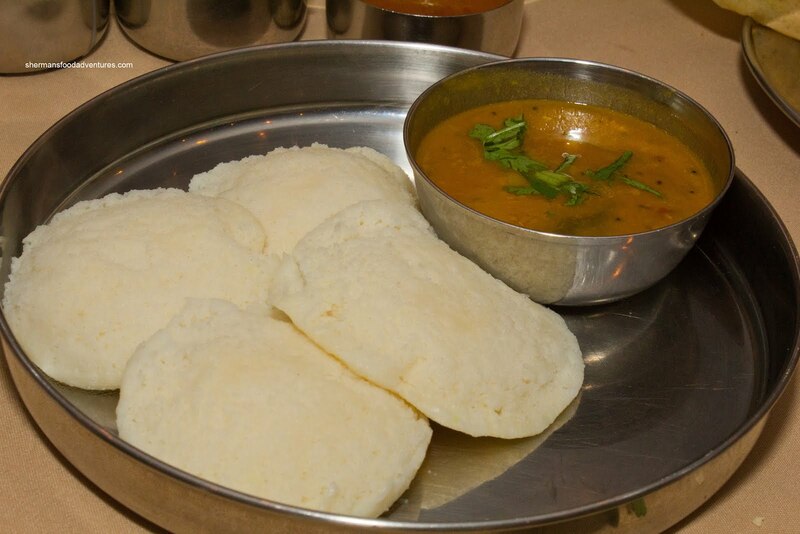 I should have kept my mouth shut, as they heard me and voila, an order of Idli (with a side of sambar) showed up on the table. These rice and lentil flour steamed cakes are reminiscent of Chinese steamed rice flour buns. These were fluffy and nicely prepared. Normally, one would dip the idli into the sambar much like grilled cheese into tomato soup. However, I like putting chutney onto mine. 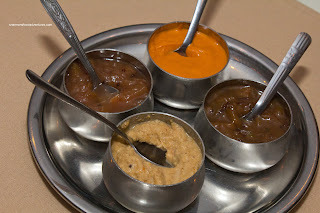 We were actually supplied with 4 different Chutneys at the beginning of the meal (hey their name is Chutney Villa after all!). Clockwise from the bottom, we had the coconut, apple, spicy onion and peach. I really liked the coconut as it was spicy, gingery and aromatic. Also, this is the one normally served with an idli. My second favourite was the spicy onion as it had a kick and curry hit. The sweet chutneys were good, but for me, I liked the savoury-spicy ones more. @Jade: sweatpants ..... sweatpants, that's the secret. @Jade & @LR Yup, I need to wear those next time.